Good morning! Today the team at Gossamer Blue is blog hopping with some of our favorite projects using the September kits. For this layout, I chose some of my favorite photos from the fall semester of homeschool kindergarten. 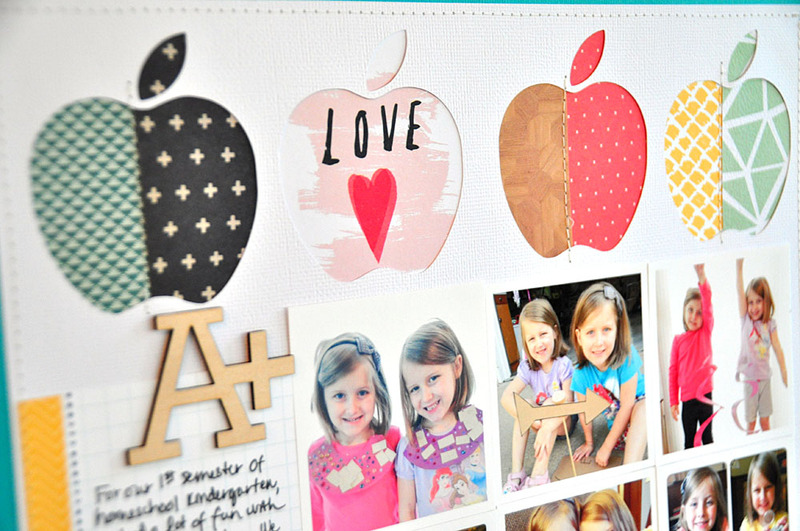 I found an apple cut file and then back the apples with two different patterned papers. I added a little machine stitching to the apples for texture. The themed Life Pages add-on had some great wood veneer pieces. I also cut up one of the cards to use below part of the title I cut with my cameo. Happy September 1st! 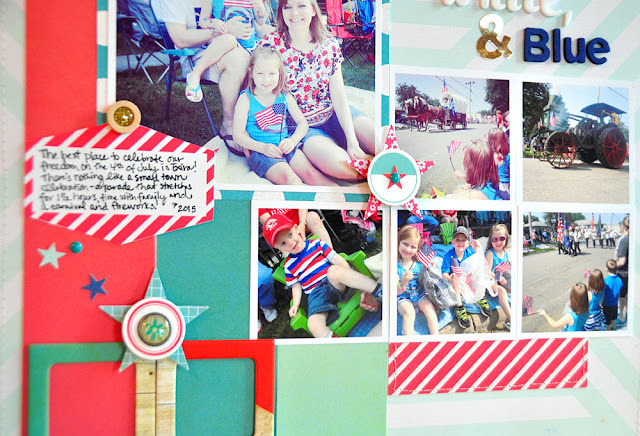 It's reveal day at Gossamer Blue and I have a couple layouts to share with you that I created with the September kits. My projects this month seemed to incorporate grids! 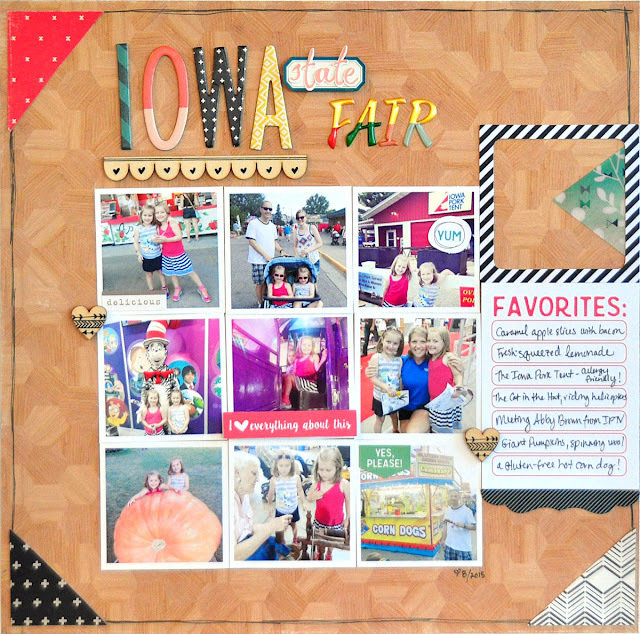 For this first layout, I created a collage of photos we took at the Iowa State Fair this year. We had a blast - from the food to the animals to the rides to looking at amazing projects! 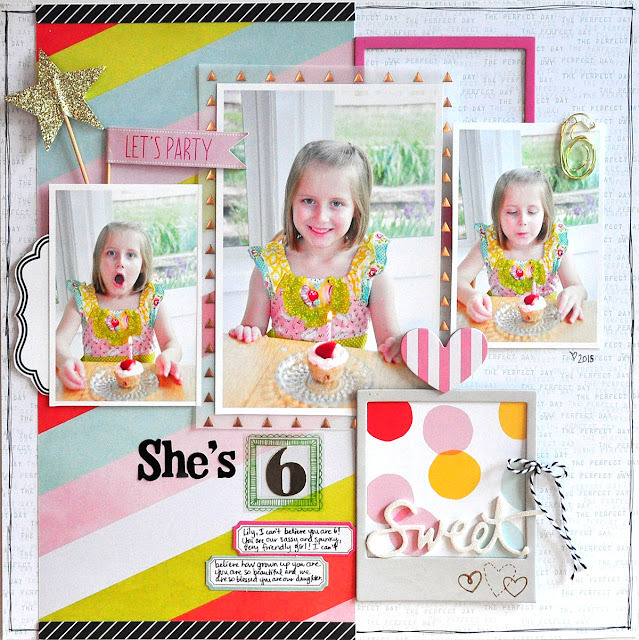 The alphabet options in the kits are so great - Crate Paper and PinkFresh - lots of opportunities to make cool titles! 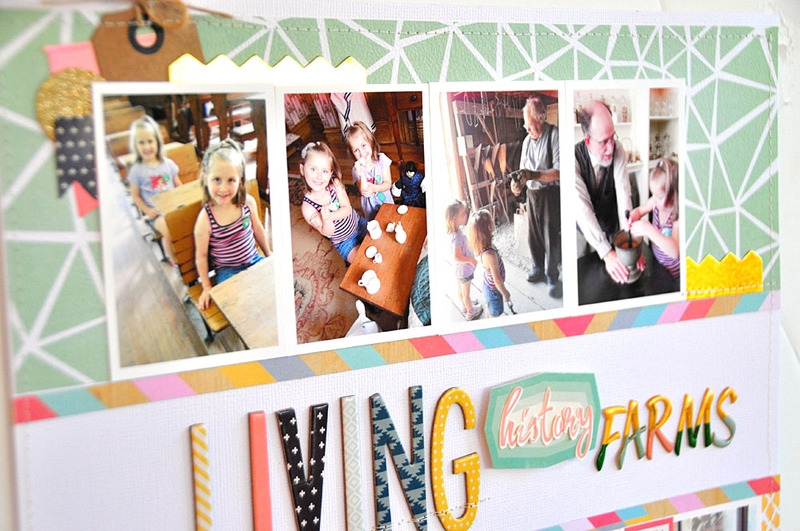 The second layout I have to share today features a trip to Living History Farms last fall. This time I put the title in the middle with the grid on top and bottom. 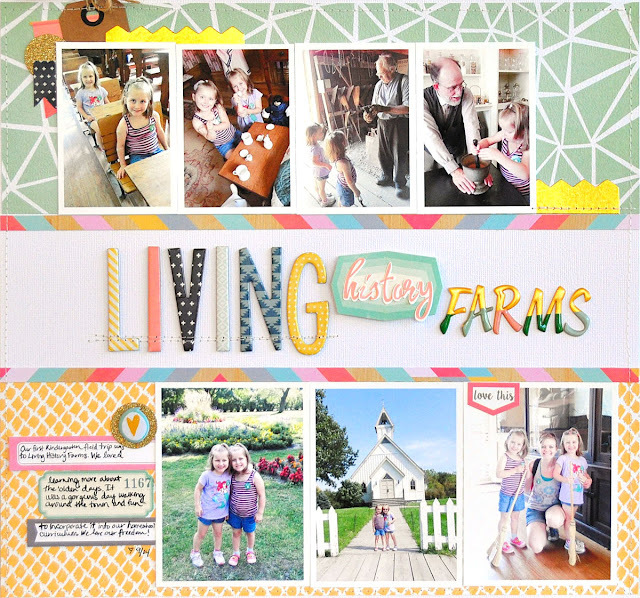 If you haven't guessed by now, I love using multiple photos on my layouts and creating a grid is an easy way to do that. Just keep most of the photos the same size and you've got a collage! Good morning! 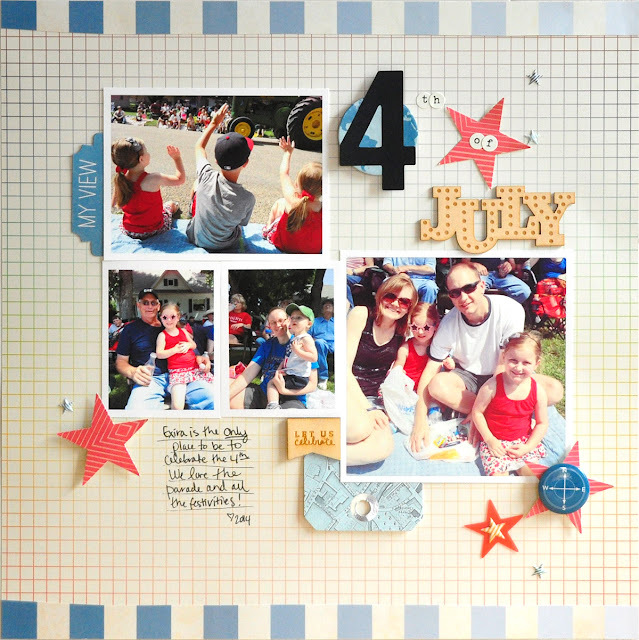 Today I'm taking part in the August Inspiration Blog Hop with other designers at Gossamer Blue. 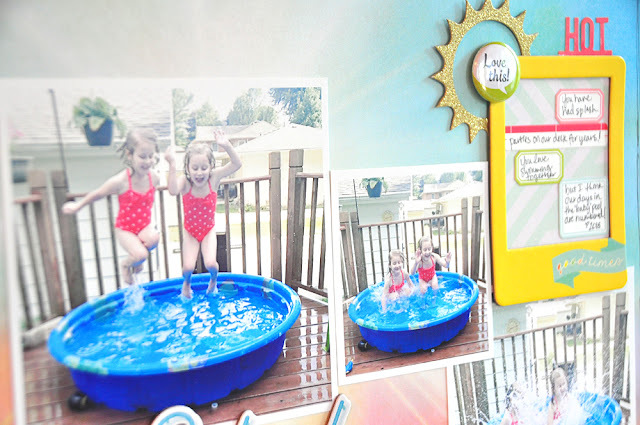 The August kits were some of my favorites in awhile because they had a summer theme! Summertime is by far when we are outside doing all kinds of activities! The girls still like playing in a little pool on our deck although they are almost too big for it now. Nevertheless, they like to lounge around in it and relax! ;) A little different from their baby days where I was watching their every move in the pool. My goal for this layout was to add a lot of color to match their new red swimsuits. 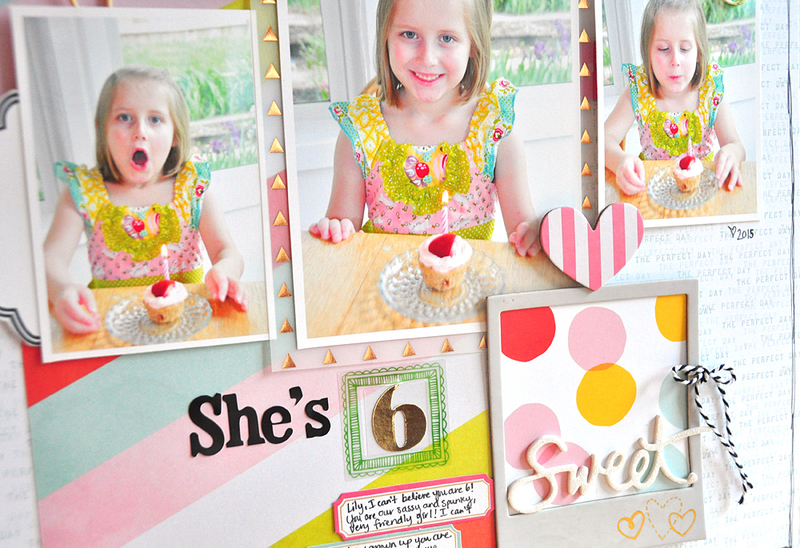 One of my favorite embellishments to work with lately are frames and these kits had quite an assortment. 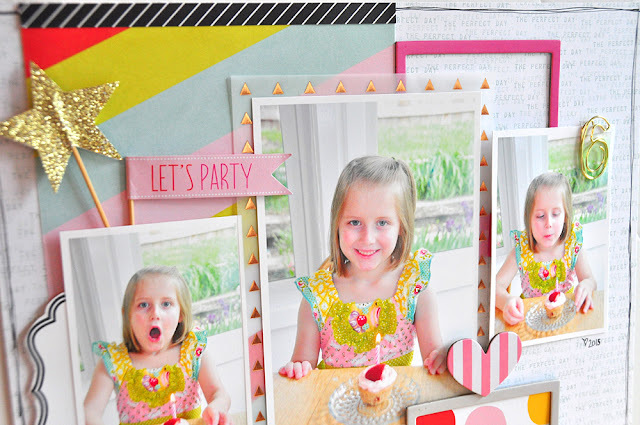 I built a row of them (backed with patterned paper) and embellished with flair, brads and more. Good morning! Today, I have a couple of layouts to share that showcase the August Gossamer Blue kits! 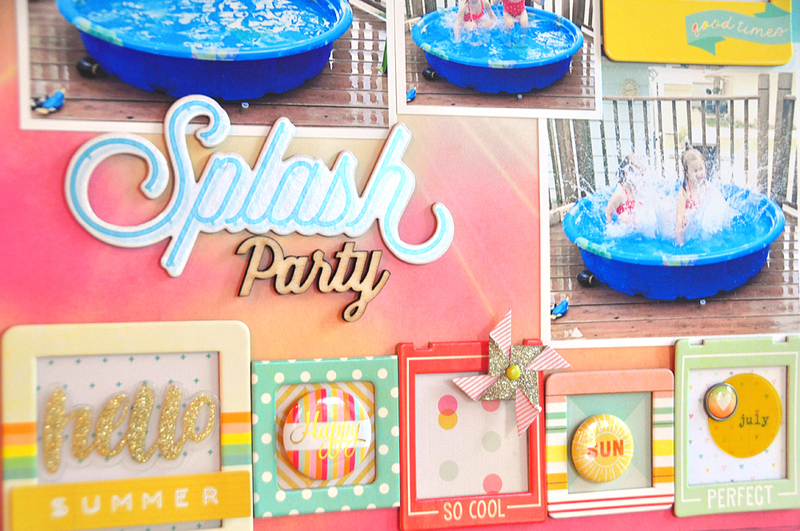 I adore any summer themed products so I went a little crazy buying extra add-ons this month. I can't resist brightly colored papers and embellishments! 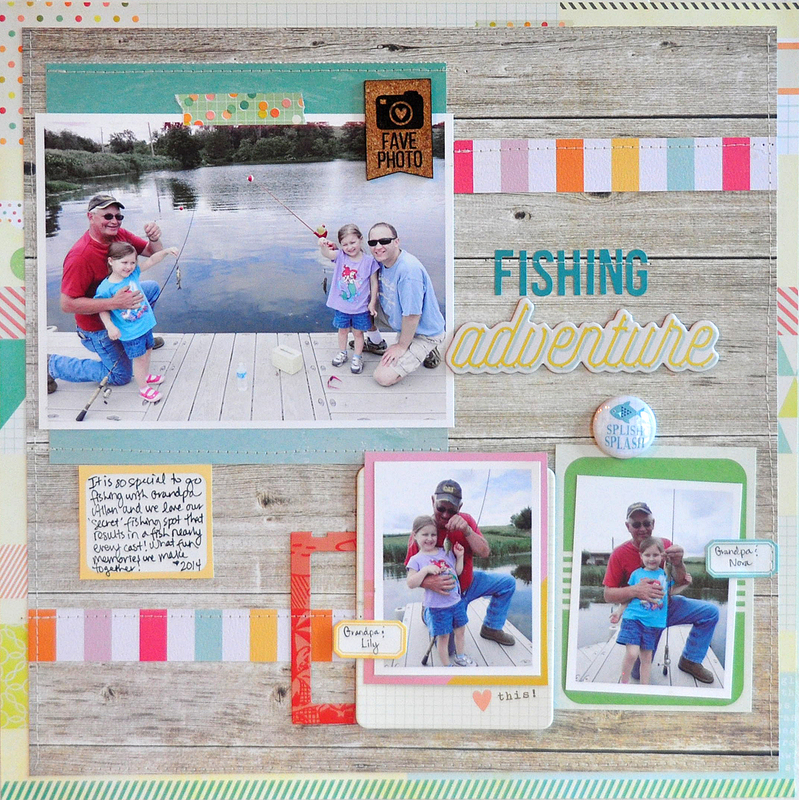 For this layout, I was able to document a fishing adventure with grandpa from last summer. 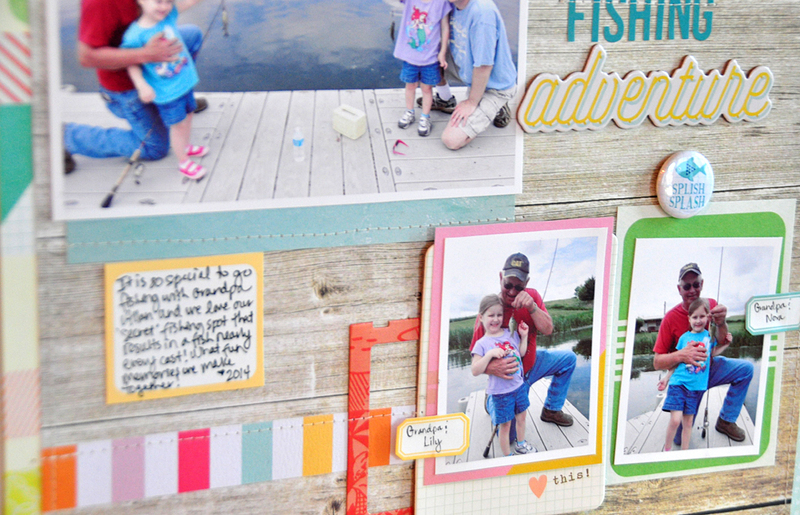 The patterned paper stripes help out some pops of color and I love that little "splish splash" fish flair. 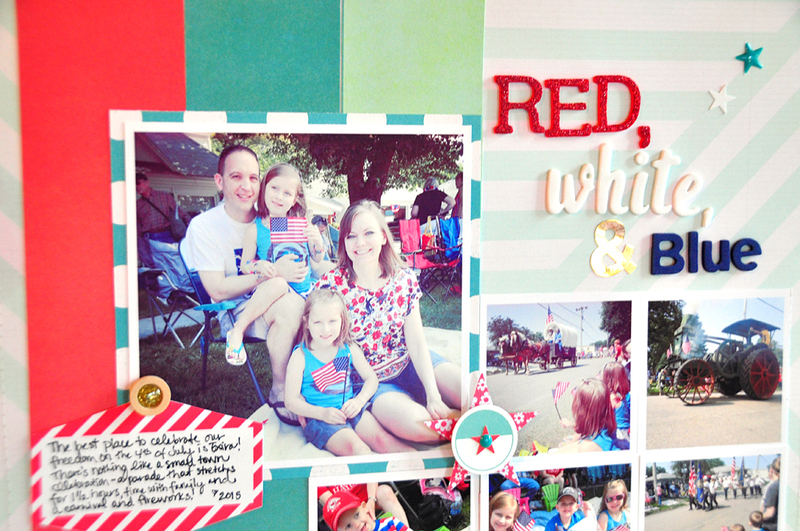 Next, I already have the 4th of July on a layout! 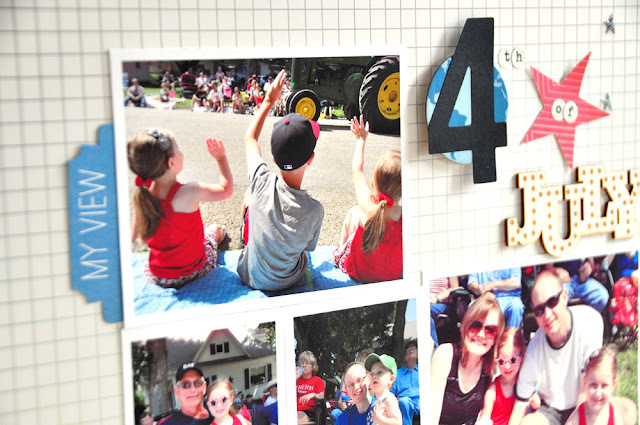 I chose some of my favorite photos from the parade this year and printed our family photo larger to help it stand out. 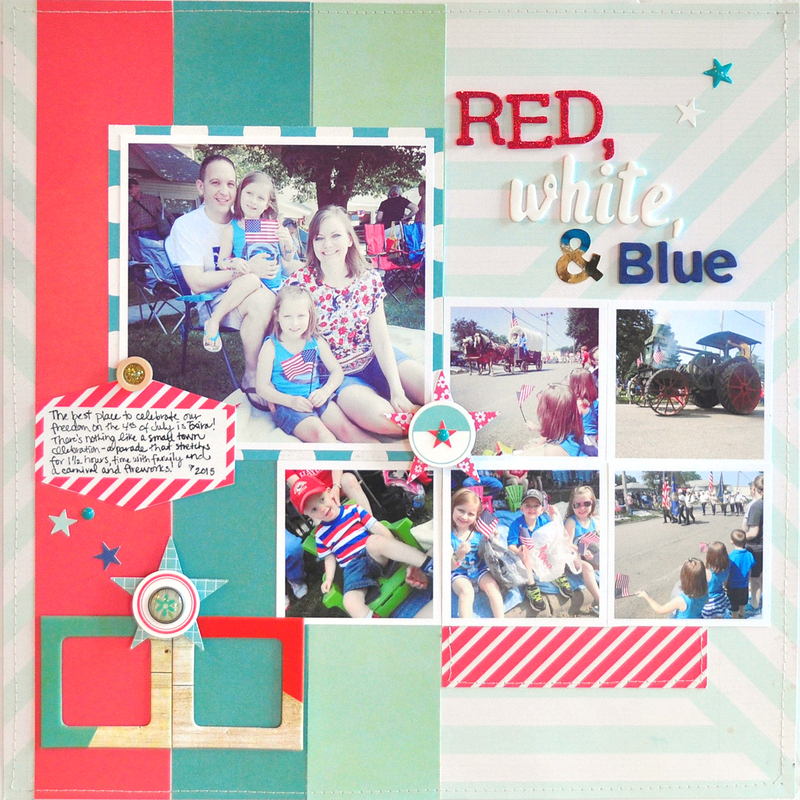 I pieced together red and blue stripes and then added some great red and blue embellishments from the kits - frames, brads, enamel stars and dots and stickers. Good morning! 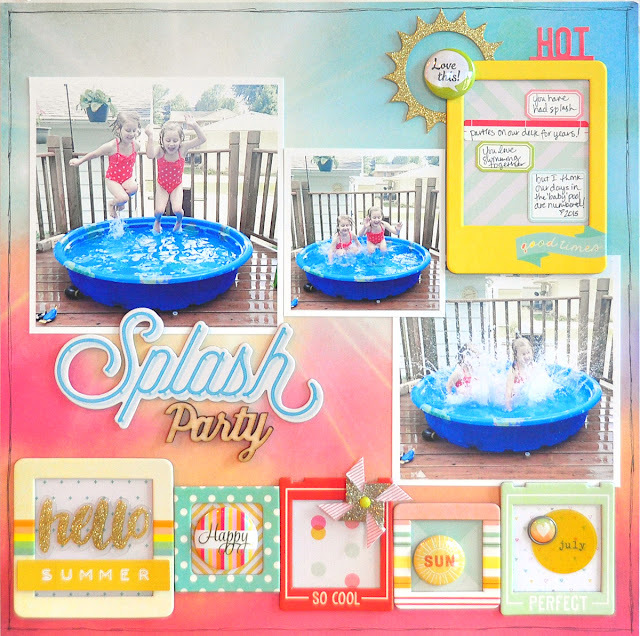 Today I wanted to share a couple of my projects with the July Gossamer Blue kits. 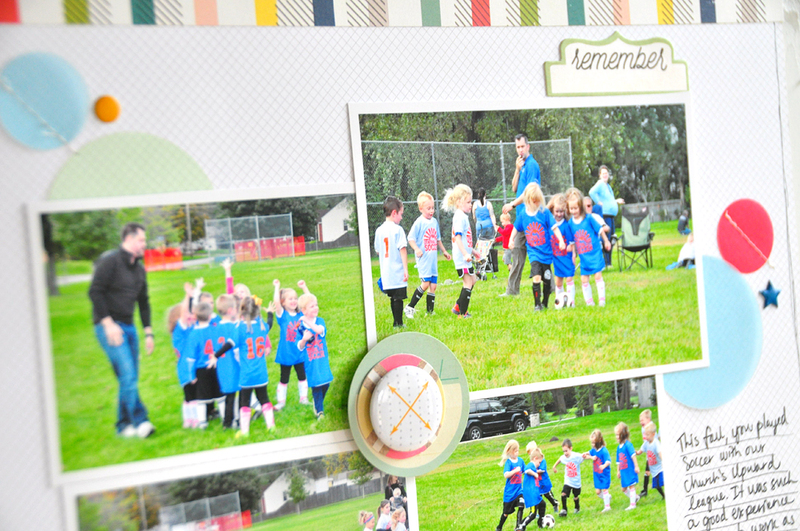 I had not yet scrapbooked any of the girls' soccer photos from last fall. The bright colors in this kit just screamed 'sports' to me so I chose some of my favorites of them playing. 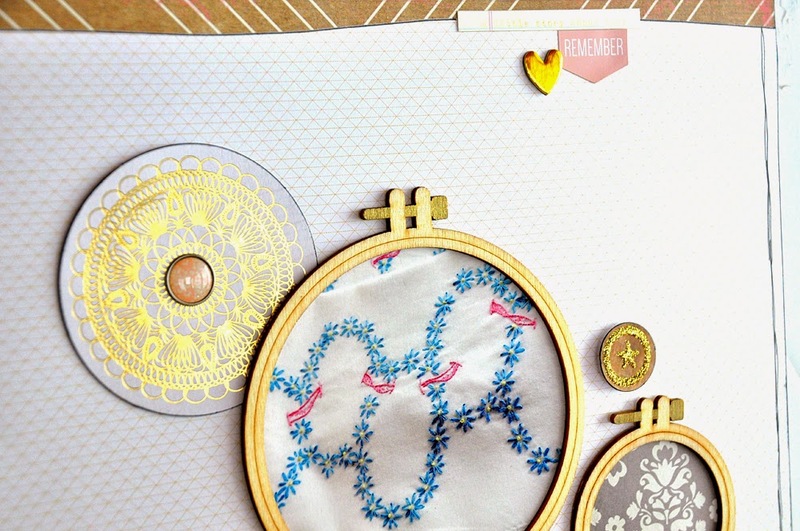 I loved the vellum circles in the main kit. An easy way to attach vellum? Just sew it on! 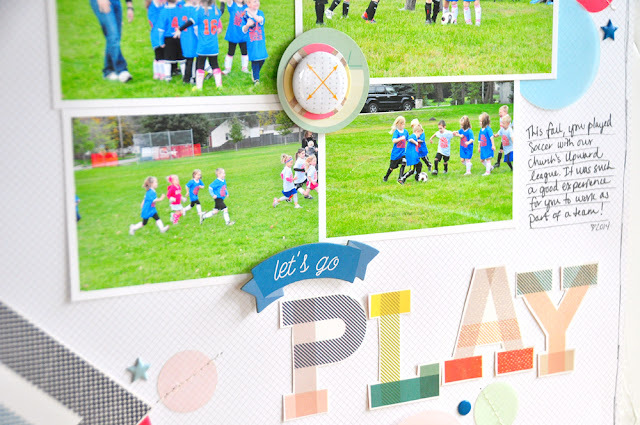 I cut the title "Play" out of a piece of alphabet themed paper in Shimelle's new collection from American Crafts. I had also not yet put last year's 4th of July parade on a layout yet so I chose out elements of red, white and blue. I punched a few stars from patterned paper and then used 'puffy' stars here and there. 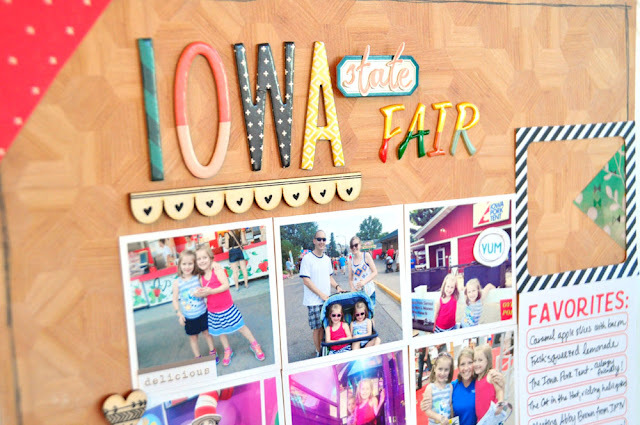 I loved the "July" exclusive wooden veneer embellishment - perfect for my title! 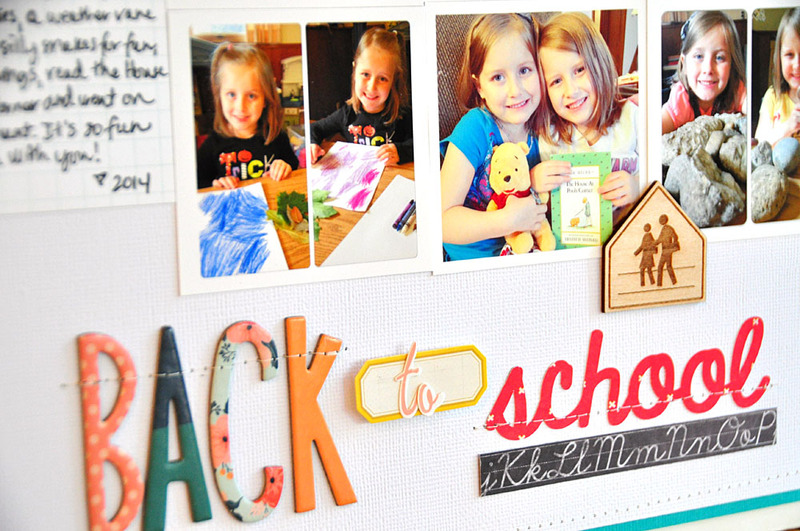 Lots of simple and effective embellishments - this one was easy to put together! Good morning! 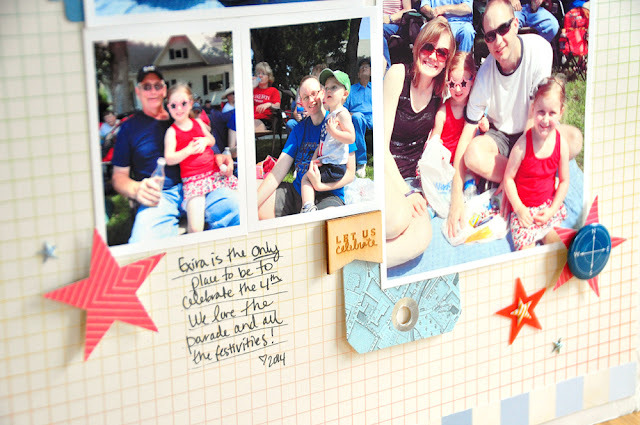 Today, I'm hopping along with the design team from Gossamer Blue and we're sharing some inspiration with the June kits. 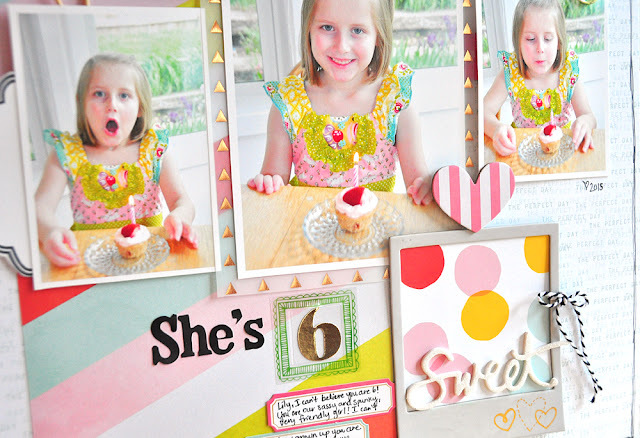 This was my favorite page I made with the kits featuring Miss Lily turning 6. I've become a lot more intentional about the pages I'm adding to our albums. Years and years of trying to come up with layouts for assignments has changed my perspective greatly. 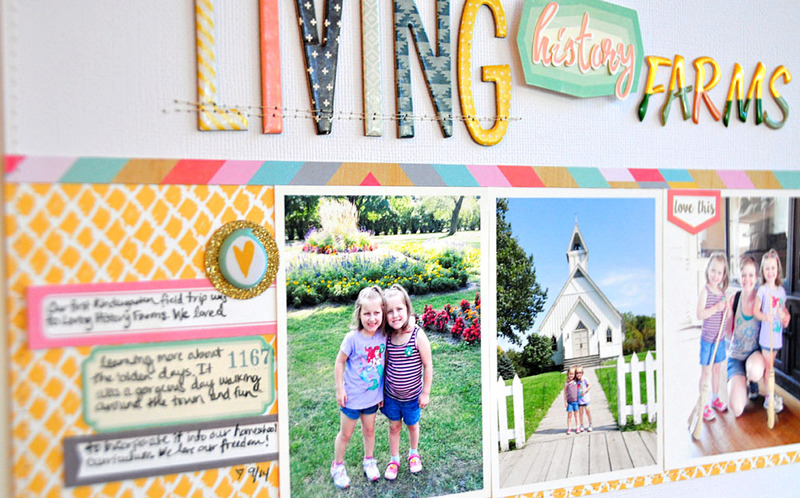 I've been adding pages outlining more milestones and a few events and then trying to capture more of our everyday life by creating Life Pages on a monthly basis. I'm about 6 months in and this is working really well for me and my family. This page is all about minimal layering. I loved the colors so much! So bright and fun for a birthday page! I love creating these pages each year. 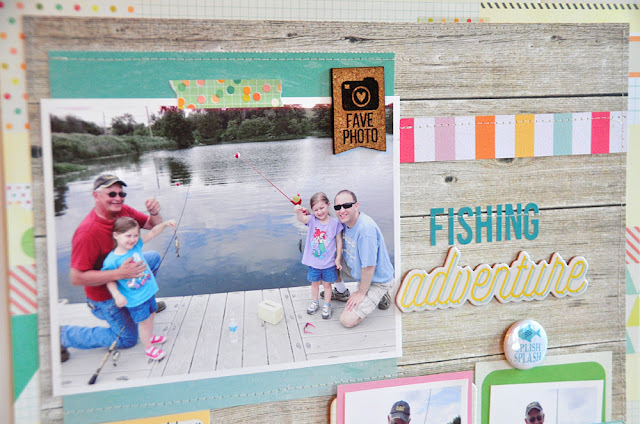 I love that Amy Tangerine chipboard frame - perfect for capturing a favorite sheet of patterned paper with a few embellishments. And here's the rest of the team participating...it's our last blog hop for the current term! Today, I'm hopping along with the design team from Gossamer Blue and we're sharing some inspiration with the April kits. 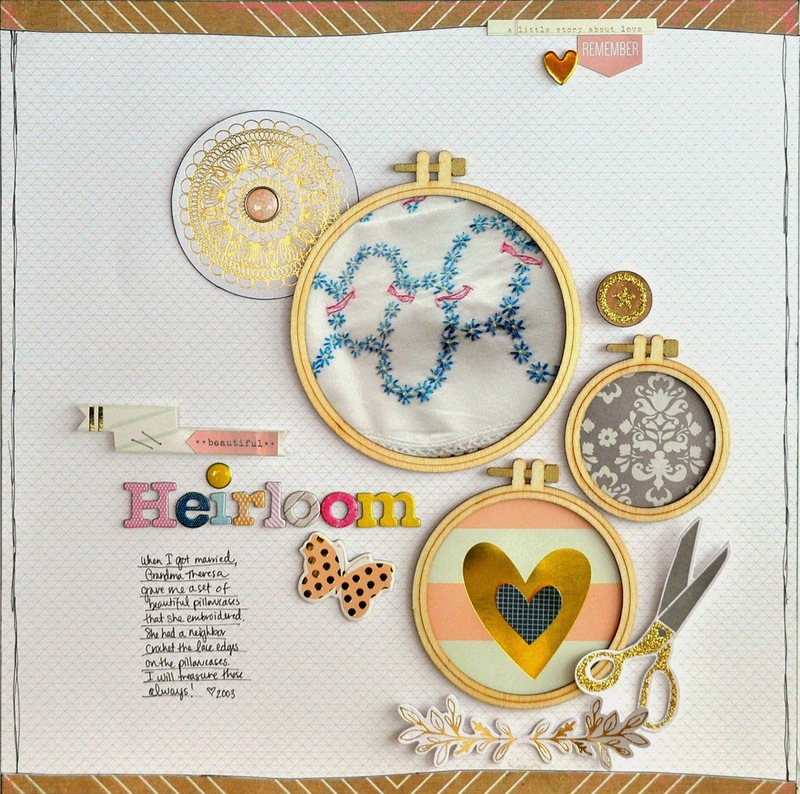 I usually only scrap about my family but this month I was really inspired by the wood veneer embroidery hoops that were included in an add-on kit. I love to embroider myself (and really need to take it up again!) but for this layout I wanted to document a set of pillowcases my grandma made when I got married. 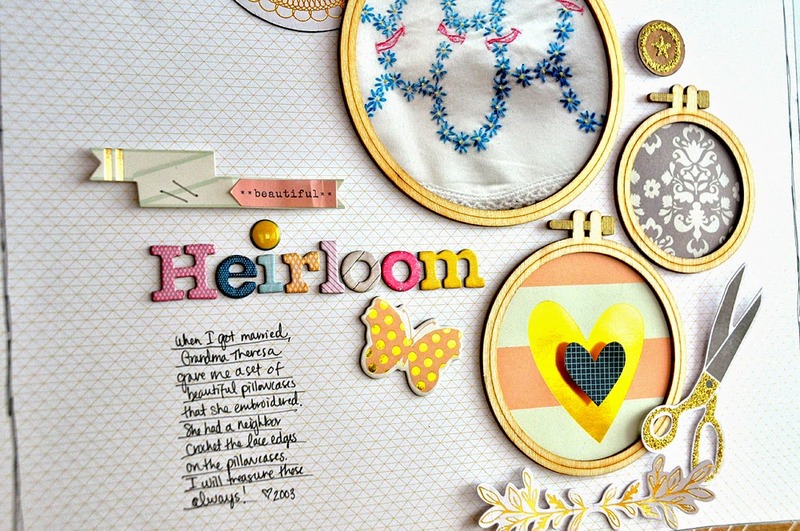 She was one of the people who taught me how to embroider so it was important for me to create a layout about these pretty heirloom pieces. 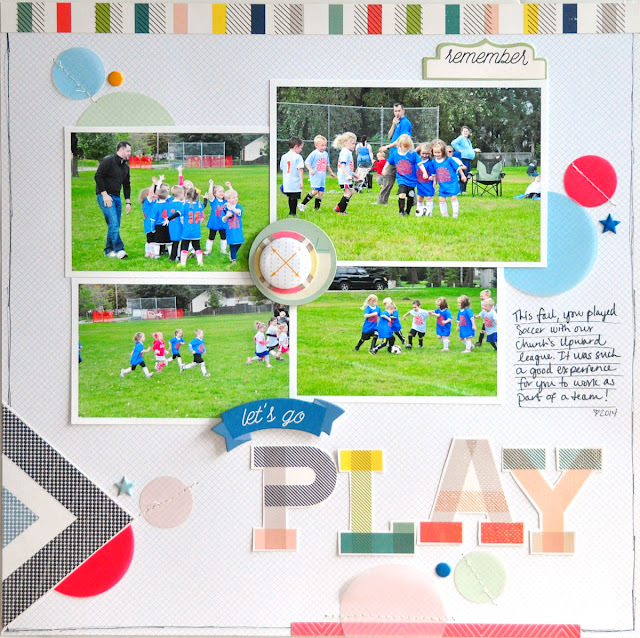 I kept the circles in mind as I continued my design with several other circle die-cuts and embellishments in the kits. 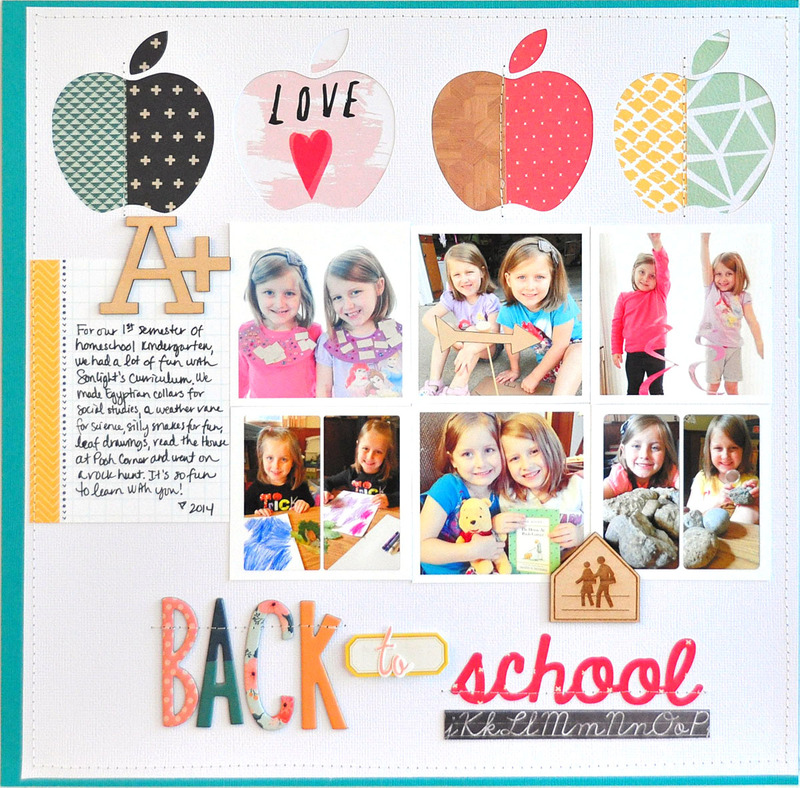 I absolutely loved the mix and match chipboard alphabet set from Crate Paper in the kit! To hop along with us, here is a list of all our participants this month! 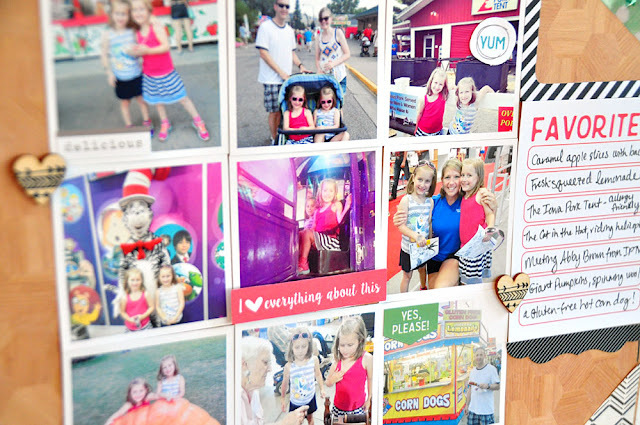 Remember you can always reference the Gossamer Blue blog for a full list of participants!